Kristin Miller Hopkins is an artist + educator + designer living in south Florida. Her fine artwork creates habitats, investigates spaces of the home and uses natural materials to question narratives through the delicate layering of mixed media materials. 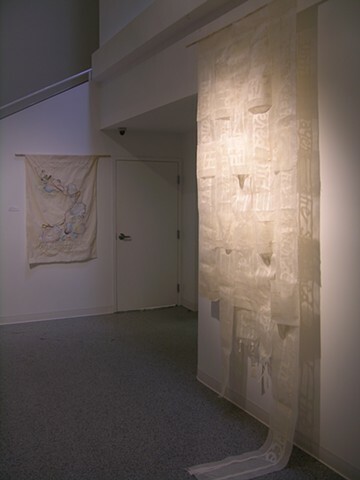 Common materials include sewing, hand drawn/sewn text, watercolor, drawing and alternative photography processes. Selected as an artist in "ArtCurated" part of the ArtFTL art fair. ArtFTL: January 24-27, 2019. She is a Professor 1 of Art + Design at Palm Beach State College and has an M.F.A. from the Visual Studies Workshop in Rochester, NY and a B.A. in Studio Art from Florida State University.